Saturday was our last day in Tucson and we planned to hit JG&M Expo and then either Holidome or Gem Mall - but once we got to JG&M all else was forgotten! LOL! I found some wonderful vendors and visited with a newly met photography artist and by the time that was all done we had to get gas, eat, get our bags and head to the airport. Fortunately another friend, Ann Marie, joined us since she was flying out on the same flight. I did HAVE to pick something up in Holidome and she wanted to see it so we dropped her off and she picked up my item and browsed until we finished all our errands. Then we picked her up and off to the airport we went. I'm back in San Diego now and am starting the slow process of entering everything into my inventory database. But enough of that boring stuff - on to the fun at JG&M. As we wandered the aisles of JG&M we saw many fossils and minerals, cool photography of gemstones by Mike Woodworth and then I went in search of the BC Jade my friends told me about. I found it at Alaska Scrimshaw Connection owned by Dennis and Michelle Sims from Houston, Alaska. They only had round beads - but they were pretty and I love the gorgeous natural green of this stone. My mom picked up some fossilized walrus teeth and fossilized walrus ivory. 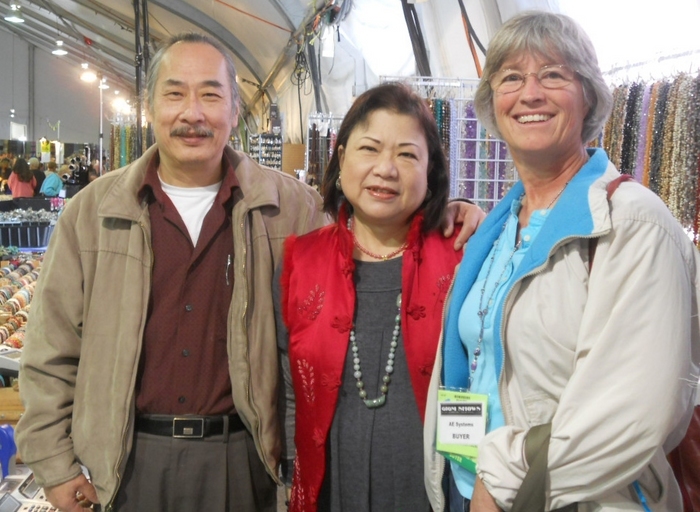 Right next to Dennis and Michelle was Feng Imports, owned by Toyo Feng. What drew me to this booth was some beautiful jasper I've never seen before. Toyo called it mosaic creek jasper. He said it is red creek jasper with pyrite. It is beautiful and the patterns are just amazing. He also had a beautiful green alligator jasper. It comes from South Africa and the color ranges from a wonderful soft, almost mint green to an olive green. I bought some strands of beautiful graduated rondelles in the more olive green and then some wonderful rectangles in the minty green color. It, too, has beautiful patterns and this is the first time I've seen it. I enjoyed talking with Toyo and look forward to seeing him again next year. I went looking for Ann Marie and found her oogling some beautiful cabs and slices at Tony and Dolores Worth's booth. She needed to get the $$ value up to hit the first discount level so I figured it couldn't hurt to just look ... Well once I saw matched cab pairs I was hooked ... I hate matching pairs myself so when I find them already matched I just get an urge to buy some! Needless to say I was able to help her get to the needed discount level and got some beautiful cabs in the process. After that we had to stop shopping and do all our preflight errands. We dropped Ann Marie off at Holidome so she could do some shopping and also pick up some items I ordered on Friday. 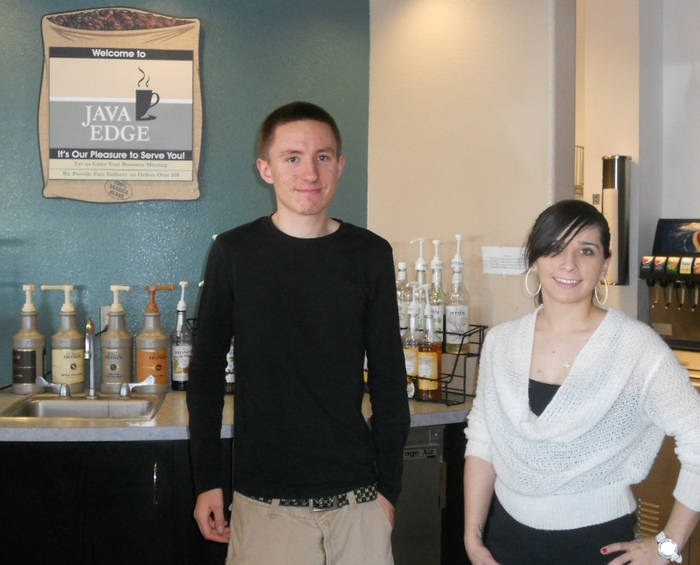 While she shopped my mom and I filled the car and then stopped at Java Edge for lunch. It's right at the corner of Ajo and Palo Verde so if you want to get away from Holidome for a nice break - drive down, have a seat and enjoy! After a pretty bland meal at Chop Stix (next door) several days earlier (a clove of garlic would have helped tremendously!) - this meal was from heaven! We each had a sandwich (BLTA for me, Reuben sans cheese for my mom) and loved every bite. The bread is fresh, they use butter lettuce instead of iceberg, the tomato was a nice red (none of that yellow, not quite ripe look) and the bacon had a wonderful flavor! Needless to say we'll be going there for lunch next year too - probably more than once. It is just so hard to find good places to eat in south Tucson - at least for food I like to eat. We did get a picture of the 2 folks running the place while we were there. Did I get their names? Of course not - but they were both incredibly polite and helpful. Our next stop was the hotel for our bags, then we picked up Ann Marie at Holidome and finally we were off to the airport for the flight home. It was a relatively uneventful flight and it's good to be home! I'll be taking pictures of some of the beauties I bought so I can share some of nature's beauty with you through the week. It's getting colder in Tucson in the AM now. It was 45F degrees when we headed out to breakfast at the Waffle House next door. Check out my post from last year for pictures - most of the same people are still working there and they still make the food exactly how you want with no complaints. After that we made a quick run to the Best Bead Show. I happened on some lampwork disks that would match the wonderful blacks/browns/white in the black agate with quartz beads I bought so I got those. 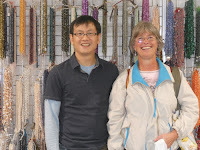 Then I met a gal who owns San Fran Arts & Craft and has some true vintage Czech and Japanese glass beads. She had some very unique beads that I wanted for my stash. And, of course, I forgot to take a picture. Her store is in Sonoma though so I can keep an eye out for more unique beads when I go up there to visit relatives - yay! The folks I really wanted to see - Blue Heeler Glass - weren't able to come after all. Wah! Another impulse buy nipped in the bud! Next we were off to To Bead True Blue to visit my favorite lampwork twisty maker Colleen Girard. She is CLG Lampwork and you, too, can buy her twisty beads (and focals of course) online. We found her at the show and what should we find? She didn't bring any twisties!!! Ack!!! I was so disappointed! (like I really need more lampwork beads) We chitchatted with her a bit and she told me to send pictures of whatever I wanted twisties to match and she would make custom ones in the appropriate glass. Of course I knew this already - I just wanted to do some impulse shopping! Her twisties are just so touchable and fun to peruse! We went looking for a gal who does gorgeous bead embroidery on cuffs and such. My mom bought a beautiful bracelet from her a few years back at the Pasadena Bead show and wanted to say hi and show her the bracelet she made. We could not remember her name so we checked out most of the rooms but couldn't find a sign of her. 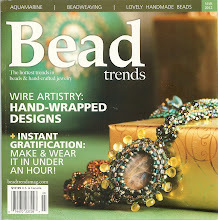 As we were looking for her we ran across BeadsAddict and their absolutely wonderful drusy! Widya's (on the left in the photo) family, in Indonesia, creates these beauties! She was able to answer any question we had on the stone and the guy helping her (did I get his name??? no - agh!!) is a consumate salesman. He kept helping us find more drusies in the style we seemed to prefer and then would show us other things "just in case" we might like them. They were both very gracious and helpful. It was a definite pleasure doing business with them - and you can too! I also included a picture of one of the trays of drusies. Next stop was Starbuck's - yay! We were feeling Starbuck's deprived since there isn't a single one to be found in south Tucson. Since we were in the central Tucson are for TBTB we knew there was one somewhere and found it. The hot mocha was yummy! Then it was down to JOGS. I had a list of folks to see and found most of them. Fortunately I found some new ones too! Last year I didn't actually wander up and down every isle so I figured it would be a good thing to do this year. 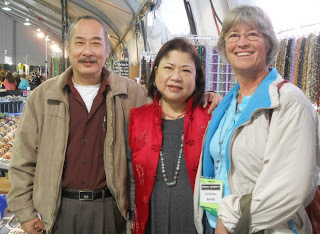 I was sure glad I did because I wandered into the turquoise section and found some wonderful beads (that I had to have) at the Eljen Group's booth. Elven and Linda (pictured below) were absolutely wonderful people to buy from. Linda was especially helpful since we both had similar tastes in colors for design. She showed me some absolutely luscious turquoise beads they'll have next year and I just have to get them. You'll have to wait until next year to find out what they are! 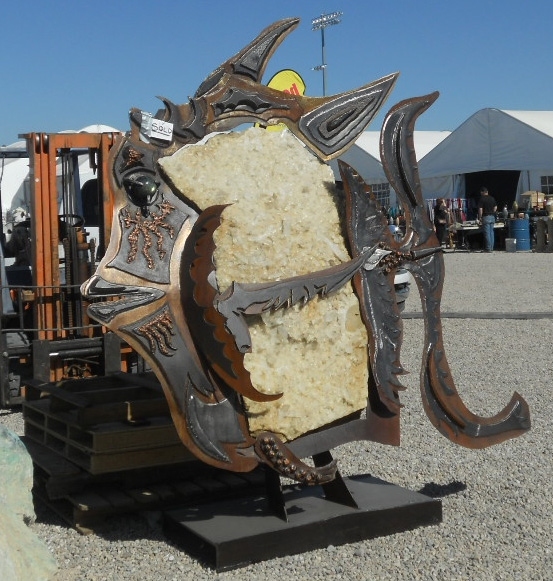 Years ago Elven was able to buy the last remaining rough from the #8 mine (perhaps I should say - known rough - who knows what might be hiding in some warehouse somewhere?) and he developed a way to harden it to make it useable. You can read more about the Eljen process which is used if you google it. The GIA has classified turquoise treated with this process as "impregnated natural turquoise". Here are Linda, Elven and some of their beautiful turquoise! ﻿We wandered around JOGS until I think we covered every square inch. I did see some gorgeous rhodocrosite and sugilite at Kameyab - but just couldn't afford them! 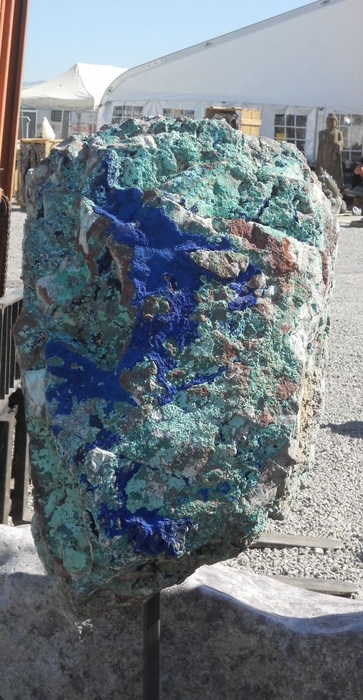 My mom found a Bisbee turquoise cabachon that was calling to her too but just couldn't afford it either. Neither of us dare walk into JOGS tomorrow - or we might give in to temptation! Since we finished up a bit earlier than expected we went back to Holidome to wander through the ballroom area. We also made a quick run through another room where my mom found some wonderful multi-tourmaline rondelles and I found some interesting iolite square brios. I'm always looking for interesting cuts and these drew my eye. I can't wait to make something with them. Next we headed into the big tent to get some wonderful sterling findings from Stones and Findings. 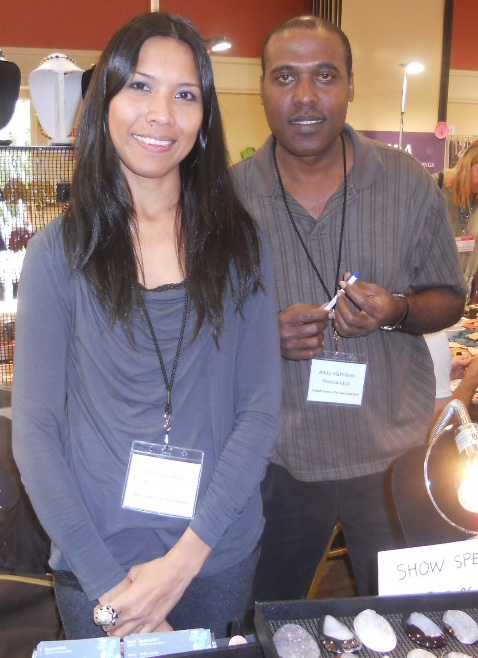 Some of my other jewelry designer friends found this booth yesterday. I got sidetracked with the rhodocrosite heart brios at the booth across the aisle and by the time I was done there I had to leave and didn't get to check out the sterling. So today I took time to peruse all their beautiful sterling findings and make some selections for my own designs. You'll be seeing those at some point in the future when I design with them. My last stop was Azur Global Imports. I am always on the lookout for 22" sterling finished chains. They are incredibly hard to find and only seem to be available in Italian chain. I have no idea why - but when I find a source for them I rejoice. My last source, found at a San Diego Gem Faire, just disappeared off the web. Today I got to rejoice again! Yay! I now have more 22" sterling snake chain in stock. - OK - so small things make me happy - what can I say? At that point my mom and I were both done in so we headed off to get dinner, came back, packed and are now heading off to sleepy-land. Sleep well everyone! Tomorrow night I may have time to take good pictures of my finds and share the beauties with you. Back again and these posts are getting later and later at night! Today we started off at Tucson Electric Park. Our hotel is near Holidome and it was a nightmare of traffic this morning! The show opened today and anyone showing up at 9:45AM was in for a looonnnnggg wait to get into the parking lot. I knew it would be a mess which is why we went elsewhere this morning. 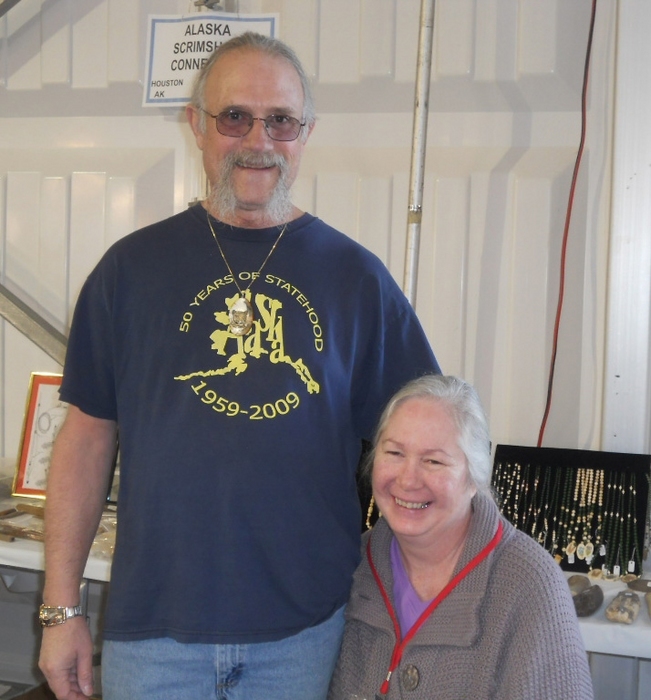 One of my favorite gem sellers, Royal Quality Gems, was at TEP again this year. I couldn't find a web link for them. Here's a picture of me with the owner and his wife. My next stop was Miland Tools. I had a list to check out and Miland gladly showed them all to me. I changed my mind on a few things and added some texture hammers to my to-buy list as well. Miland makes his own tools and has a money back warranty if you don't like the way they work. I love visiting with him and his son!﻿ Darn it if I didn't get pictures of him again this year! After that we wandered around TEP just to see what else was there. 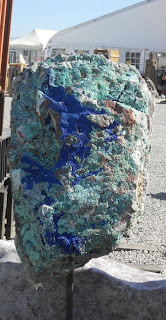 My mom bought a beautiful cabachon from Zee and we saw this interesting rock fish art and I would LOVE to have this chunk of stone with malachite azurite in it! Next was lunch and then Holidome!!! No pictures from Holidome but I finally found those darned rhodocrosite heart brios! Yay! Hopefully the gal who wanted them likes them - LOL! If not there are others who will. And, of course, I visited my favorite sterling bead seller, Kalpataru, again. ﻿And I made another quick visit to Lucky Gems for more rondelles (at the request of some friends). My mom and I wandered around some more, stopped to check out a few more places - one of which had the rhodo brios as well as some lovely ametrine brios and faceted ovals - quite yummy. My mom also found some beautiful fluorite at one place (I'll have to dig up the card and update the blog later) where I also found what they called "cocoa quartz". They said it's natural. I've never seen it before - but I love the rich brown color - so I bought the 4 nicest little strands. After Holidome my mom and I joined some other beading friends for dinner and goodie show-and-tell. Oh - what beautiful and interesting things everyone bought! Lights out now and I'll write for you all tomorrow. Today we hit more shows and found more goodies! We started at the Howard Johnson Gem and Mineral show. We went there to see Rhodo Co. They supposedly opened at 9:30 - but not really so we went wandering around the hotel rooms that were open and had a blast shopping and talking with the guys at Nevada Turquoise Co. I took a really bad picture of all of them and, of course, I forgot all their names and didn't write them down! 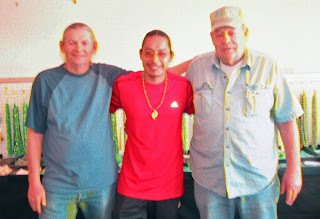 The guy on the left (Shellbone is his name according to their web page) owns the mines that almost all the beads and cabs come from. His dad is on the right and he helps out. One of their friends, in the middle, is a direct descendant of some of the Indians who fought at the Little Big Horn. It so happens I'm distantly related to Marcus Reno who was one of the few U.S. soldiers to survive that battle. So we had something to talk about in addition to turquoise! Anyway, since they mine and cut all the turquoise themselves they could tell me exactly where it came from, if it was stablized, ... Very little that they sell is stabilized and prices were very reasonable. I had a wonderful time in their room, their turquoise is beautiful and I highly recommend them to everyone else! Then we wandered all around the other booths, rooms, tents, ... and thoroughly enjoyed looking at all the gem and mineral specimens that abounded. I took pictures of some of the booths - but they were terrible! Next up was lunch. We went to El Minuto - right near the convention center. The food was good, but it was incredibly busy so service was brusque. Nevertheless we rehydrated and reenergized in preparation for the 22nd street show. They have a LOT of fossils here and it's a retail show. Nevertheless I did get some beautiful black agate with white quartz matrix beads. They will make beautiful focals! No picture of those yet though. My mom spotted those. I was walking right on by the tables since my eyes saw the dyed and crackle glass beads and just glazed over - LOL! Fortunately she isn't quite so judgemental about these things. Last on our stop was a quick run through the Gem Mall (we had to go that way to get to our car - so why not shop on the way out????). I found my favorite sterling seller, Kalpataru, bought some things, talked a bit with the owner (no picture - again!) and by then we were pretty much done. We glanced at tables as we left - but I was just too tired for any more shopping. So that's it for today. Now it's time to hit the sack and get some rest in preparation for the Holidome tomorrow! Sweet, sparkly dreams all!